This is the planning and preparation as it happens, good and bad. 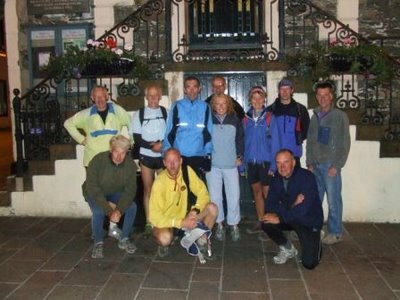 In 2007 I ran the Lakeland Classics to fulfill an ambition to do all the Super Long races in one season while I tried to work out what to do next. Already old enough to attempt a 50 at 50, I decided to wait until 2008 and attempt a 55 at 55. Two unsuccessful attempts and I decided to to have one more go in 2009. 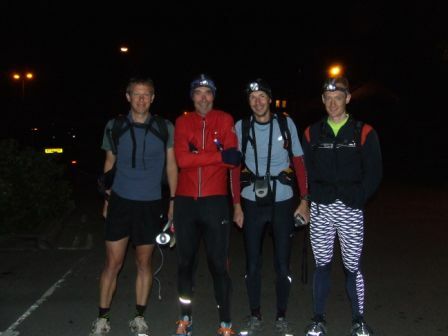 Mark Davies navigating with John Swift, Christine Bland and Martin (whom Christine propositioned earlier in the day, "Going out for a run tonight? Oh, so am I - why don't you come with me?). Last change of shoes and socks and with almost five hours we are off to the last three climbs. Halls Fell Ridge is still a joy even after 22500 feet of climbing and we are on Blencathra faster than the schedule requires. Mark heads off to Mungrisdale Common on a line that couldn't be bettered and before long we are heading towards the sheep shelter and river crossing. It is astonishing just how much the vegetation has grown in the last seven weeks and before the river we are reduced to a fast walk. Over the river and into thigh high heather. As Martin remarked - "Who ever thought of this as being Lucky Heather needs their head looking at". Escaping the clutches of the heather we start to climb Great Calva (my 5th time this year, 4th by this route) and, as with Blencathra, this is very familiar ground. I deliberately recced this part of the route again and again so that no matter how tired I was when I got here I would know how much is left do at all stages on each of these last climbs. Taking more food and drink on the way up I can begin to consider 'just one more climb' and on Great Calva's summit I look across to Skiddaw in (nearly) the last light of the day and contemplate the last big effort before the final descent. Leaving the summit Christine urges me on, reminding me that with two and three quarter hours left "you have done it, all you have to do is get up there and down to the Moot Hall". It is not done until it is done and there is still a bit to do, not as much as there was. Down to the bridge and a good line across the valley bottom (thanks Martin) but the growth on the Skiddaw side is much high than 7 weeks ago and in fading light it is a struggle to find the trod we want. Martin, John and Christine all take turns to shepherd me through the rough stuff and only once do I find a thigh deep hole for my right leg. This can be the hardest leg to navigate because it has an absolute deadline, too late on this leg can be really too late - as I know already. Mark is doing a great job and here I start to make it a harder still. I know on Skiddaw summit, in the dark, the ground is too rough to run by torchlight (unless time is very short), I also I am not going to have a fast time anyway and now it is more important to get to the Moot Hall by midnight than to trip or go over on ankle trying to save a few minutes and so I slow a little to a steady climbing pace. At the time I didn't realise Mark was already concerned about how time is slipping away but we reach the fence and start the final pull to the 42nd summit where we are battered by a strong very cold northerly wind that hasn't been felt since Scafell Pike. The clouds are down again and as we approach the Trig Point Jim Bispham and Keith Foster appear out of the darkness. Just after the Trig Point Ed Swift appears out of the gloom and we have almost for a party but the descent remains to be done. Off the roughest stuff and a steady trot is adopted and, I think, Mark begins to relax a little as the lights of Keswick appear below us. I look at my watch for the last time to confirm there is time enough. Having got spread out on the summit the group is almost complete as we leave the car park at Latrigg and start the final stages. Emerging from a ginnel into the market square with about twenty minutes left, flash guns go off and I touch the Moot Hall to finish. Hug and kiss from Pauline and we can both relax and enjoy the moment. Adrian & Sarah offer their congratulations as does everyone else, including strangers just walking by. It'll take about a day before it all begins to sink in and I really want everyone who has taken part to be here so that I can thank them because without them I couldn't have done it. I had six fantastic support teams, 1 for each leg and 1 for all the road crossings. I am overwhelmed by the effort everyone made to enable me to achieve this. When I first read these words I knew what they meant but I didn't understand what he meant - at the Moot Hall tonight I fully understood them. Thank you all, especially Pauline, for everything today and throughout the last 11 months..
With John Fleetwood (don't miss John's video), Paul Murray, Mary White and Steve Kenyon to tackle the leg where the weather was to difficult the last time. I fell stronger than here than in June as we set off 20 minutes behind schedule and 5 minutes behind June time. By the summit of Seat Sandal the 5 minutes on the June time has been made up and we are ahead of it by Fairfield although I am about 25 minutes down on my schedule. Climbing is still good although descending is getting slower as my legs tire but we reach Dollywagon Pike 8 minutes faster than in June, probably because I have been eating and drinking better all the way round. The 22 hour schedule has slipped away but the reality is that it slipped away on this leg in June, seven weeks ago. If the 22 hours had really mattered I would have had to wait until next spring because seven weeks might be sufficient time to recover enough for another attempt but it isn't likely to be enough time to recover completely. John and Paul urge me, gently, to climb at a comfortable pace - reminding me that there is plenty of time until midnight and that almost all the climbing on this leg is done already and for the first time there are so many hills behind me that I can look around the skyline and see, not where I still have to go, but I can see where I have been and it is fantastic! It may not look like it on the video but as this leg developes I am beginning to really enjoy it. Nethermost passes and then Helvellyn where Keith Foster meets us with more drinks. Leaving Lower Man the realisation begins to dawn that I will probably reach Threlkeld with about 5 hours left, with good visability and enough strength to be confident of reaching the Moot Hall before the end of the day - its not done until its done and I'm not getting carried away but I feel a gradual relaxation and it helps me enjoy this leg a little more. Mary continues to give me food and drink on the climbs and to carry it on the descents so that I have no distractions and nothing to worry about. Steve carries the kit and the rest of the food and drink and all in all I am very well looked after. Whiteside, Raise and the Dodds pass quickly and comfortably as Blencathra and Skiddaw appear on the skyline like the old friends they have become since February. Previously I had considered the Dodds fairly uninteresting but today they provide an opportunity to savour the Lakeland ridges and I do long to stop, not because of exhaustion, but just to drink in and enjoy the experience of the day but I have do the savouring on the hoof, without stopping. Clough Head is the last of this leg and the steep descent to the Old Coach Road is terribly slow but I have so little left in in my 'descending legs' that there is little else I can do. John prefers a slightly longer but much more runnable path from the Old Coach Road and we are soon travelling quickly to the road pass the water treatment works where Jim Bispham & George Roden from Westmorland & N Lancs LDWA are to open the gate for us. Threlkeld is reached with just over 5 hours left and I enjoy my final helping of bananas and rice pudding. Breakfast done and I am off with Colin Jones (with Mac & Sandy, the trail hounds who will actually do the navigation), Alastair Murray, Phil Cheek and Annette Morris who is going to meet us at Esk Hause with more food and drink. Climbing Scafell is as hard as it was the first time, perhaps harder and although the pace is a little more gentle we are still ahead at the summit where the cold strong northerlies are particularly unpleasant. Despite the effort of the climb I struggle to keep warm and turning at the summit the wind almost blows me backwards over the cairn. Dropping down to Foxes Tarn gets us out of the wind eventually but I still add another layer because we won't be out of the wind for very long. Phil constantly reassures that the climbing pace is more than fast enough and ensures I am eating and drinking at every opportunity. Back up to Mickledor and into the wind over Scafell Pike and we have just done about 4000 feet in under 3 miles. Broad Crag and Ill Crag are reached easily and the better weather allows us to edge ahead of the June time and stay ahead of the schedule. Great End marks the end of the really rough ground and an opportunity to start jogging again. Turning towards Esk Pike we can see Annette sheltering at the start of the climb as the Langdale Pikes appear on the skyline - another distraction not to be thought about while they are that far ahead. Bright sunshine accompanies us up Esk Pike as the climb reveals views into Upper Eskdale, surely the very best of the Lakeland valleys. Looking back the Scafells are bathed in sunshine and can the views can be savoured - we've been there and can afford to look long and enjoy it. Bowfell provides a blast of cold air at the summit as if to remind us that we can't be hanging about enjoying the views. By now I think I have eating and drinking about sorted, not too much food at once and plenty of water in between the carb drinks. Rossett Pike marks a change in terrain, no more rocky ground and plenty of runnable paths and grass between the summits but it also marks the beginning of a long stretch to Pike O'Stickle. This is about halfway now and in June the effort made to get here is begining to tell on my legs. Only a determined effort during the approach to Pike O'Stickle allows me to reach the summit on schedule. Colin senses I am beginning to tire and accompanies me to the summit with words of encouragement. Revived, a little, I get to Harrison Stickle just ahead of schedule and Thunacar Knott exactly on schedule, just as in June. I am slowing down now and can't quite keep up with the schedule. This is a long leg and all the hard(est) work is at the beginning but it is at the end the price is paid. Sergeant Man and High Raise pass without incident and we take a route of Phil's to Calf Crag and now only Steel Fell and its descent are left before Dunmail. I am not unhappy about slipping behind the schedule; 24 hours is the objective, after all, and Colin reminds me about how good the position I am in actually is. Tiring , sure, but with plenty of time to get along the Dodds before tackling the final three. We are aboout twenty minutes down arriving at Dunmail. Road crossing is quick, fresh shoes and socks after a quick foot massage as well as a bit too much warm rice & bananas but I am terribly aware of the consequences of not eating enough. After about 6 minutes I am ready to get away and Rob leads off into the darkness. Grey Knotts is an awkward climb that does everything it can to prevent a steady rhythm developing and before long I am struggling to keep up with Rob and Doug. A quiet word from Chris and the pace eases. Rob was and maybe still is puzzled because he was only trying to maintain the pace we used previously but this time I have eaten so much that I feel sick. I know, however, that it will pass and all I have to do is hang on and try not lose too much time. Over Grey Knotts and Brandreth to the climb to Green Gable and although this section is a little slow we are still 10 minutes ahead and I am beginning to enjoy this, my favourite section of the route. Even in the dark the character of each of these hills is striking and Great Gable's steep rocky sides are a pleasure to ascend. Leaving the summit we know dawn isn't far away and that the darkness hasn't prevented us keeping to the schedule. Descending isn't a great strength of mine and Great Gable provides a number of entertaining routes to Beck Head and this time the rocks are dry and I am happy with darkness and dry rock - the last time it was daylight and very wet. The cold northerly wind suddenly makes its presence felt here and we stop to put another layer on and despite that the split times for this leg are within 1 minute of each other with the June attempt the quicker. Kirk Fell provides an opportunity to start eating again as the first traces of the new day can be seen in the sky. No spectacular sunrise but a gradual draining away of the darkness as we climb Pillar. There is a lot to be said for a morning start but nothing quite compares to the soaring spirits that daylight brings - I know a morning start involves a new day too but by that time I was so tired that even dawn couldn't make things seem that much better. Seven minutes ahead at Pillar and we see broken clouds on the high fells around us. It is just not possible to not look over to Scafell where the biggest climb on the route awaits but that is a distraction that has to be shut out - Steeple is the next summit that matters and it is only ever the next summit that matters. Low swirling clouds rob us of the views down Ennerdale from Steeple and I think about a hot sunny afternoon on a recce in June, sitting on Steeple's summit wondering if it was possible for life to get any better. Turning our backs on Ennerdale we head towards Wasdale. Chris continues to ensure I eat and drink enough, Rob continues to encourage while they alternately route find and hang back to shepherd me to the next summit. Doug carries and provides food and drink on demand - I can't ask for anything more from the three of them. Red Pike is crossed, Dore Head passed by and Yewbarrow reached in sunshine at twenty to seven on an unforgetable, beautiful morning and from here it is really difficult not to glance over to the slopes of Scafell. Down the scree for breakfast of rice pudding and bananas with a view down Wasdale to die for. As midnight approaches my nerves begin to calm down for the first time in a very long day that started before six in the morning. The little sleep I managed during the day seems to have done no good at all and I feel sleepy until the caffine tablets kick in. The last seconds are ticking away and I constantly think about how much there is to do before I can stand here in front of the Moot Hall again, in less than 24 hours (I hope). This will be a constant distraction throughout the day, unlike the last time when I didn't know how much there would be to do to get back to the Moot Hall. Midnight signals the 'off' and we are away - off into the darkness at a pace that won't last very long but as it subsides it brings a calmness from the knowledge that I can do this, I have done this and all I need to do is take 11 minutes off the last time and not worry about how to do it. A last minute injury to Tony Bland on Friday evening triggered a small panic as I tried to contact Mark Seddon to ask him to navigate this leg. Mark called back, as we were getting into the car to drive to Keswick, to confirm it wouldn't be a problem and again everything seems to be in place. Newlands Church passes by silently as Mark, Chris and Phil chat constantly to help pass the time and prevent the enormity of the task from intruding, too much, on a great day out. Dry and hard underfoot, even after leaving the tarmac, the climb up Robinson takes us back into the clag and a cool wind. The path along the ridge that is so easily followed in daylight can barely be found and with visibility reduced by the clag rather than the darkness concern about our precise location mounts until the tiny tarn just before the summit is reached. Over the summit and descending on as straight a line as Mark can manage we drop out of the clag and find ourselves in the right place for the climb up Hindscarth in much better nick than I was in June. Before the summit the clag envelopes us but Mark leads us straight to the summit and away again towards Dale Head. This is going well and I am eating and drinking almost to the plan, confident that if every leg goes just a little better then I will have a good chance of being on Skiddaw with time to descend to Keswick before the day is done. This, however, is a distraction and a trip or a stumble here could bring it all to an end. The final pull up Dale Head seems protracted but soon enough the summit looms out of the clag and the first road crossing beckons. Descending on the right line we find Ed Swift waiting on the hillside above the Youth Hostel and we run into the car park 5 minutes up on the schedule. The leg has gone quickly and without incident - just what I wanted. Better weather this time and I got back to the Moot Hall in 23:39:32. Details will follow in due course. It is about six o'clock and the sun is bright on Winter Hill and the weather forecast is still looking pretty apart from some low cloud tonight but it is only a forecast. Almost time to start sorting kit and making butties. I haven't done much this week, just 20 miles with 2500 feet of climbing and Tuesday morning was the last time I was out - the rest of the time, it seems, was spent watching the weather forecast for tomorrow. I am probably more nervous at this stage than I was last time but, perhaps, I can get through it before setting off and be in better nick on the first leg. Better to go and get on with things and not have time to worry about tomorrow. Holidays, injuries and other commitments mean a number of changes and more than half the runners weren't on my June attempt. Last Saturday's "Coope's Dozen" was run in almost perfect conditions, no breeze, no hot sunshine and the Pennine Peat bogs of WInter Hill are almost all dry and very runnable. Social 19 miles at an enjoyable pace even in the faster group and with two refreshment stops times are a but meaningless although perhaps I only suggest that because we enjoyed the cakes so much that we didn't get round in under 4 hours. Pauline and I had a trot round Kentmere Horseshoe on Sunday in fairly breezy conditions before going to watch the Red Arrows at the Windermere Air Show. Three outings on Winter Hill during the rest of the week to complete everything except the final week's eating and resting. Watch Borrowdale and do a few gentle miles over Winter Hill on Sunday and then just a few more gentle miles at the beginning of next week before next Friday's second attempt. Support Teams are very nearly sorted although injuries have forced a couple of changes this week and may force further changes next week. Weather forecast looks decent - no rain, no hot sunshine and plenty of cloud cover. This is still 7 days away and so could change and the height of the cloud base is not yet available - anyway, as I saw the last time, you just have to try to cope with the weather whatever it does. 'Afoot in 2 Dales' was as hot a day as I can remember in the hills, comparable with Wasdale last year, and the descent from Great Shunner Fell was without even the slightest breeze. 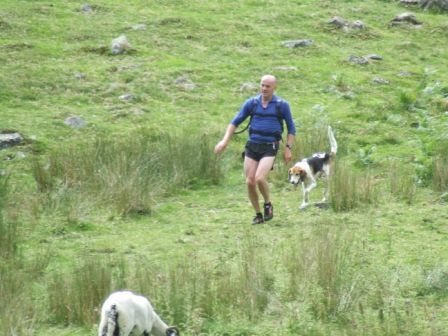 This must be the best LDWA 50 miler in the north of England, perhaps simply the best in the country. If it runs again we will be there and you should be too. Depite the heat and Pauline suffering through lack of food in the first 20 miles we took an hour off our 2004 time and were very chuffed to finish in the daylight. To give my legs a chance to recover, on Sunday, I took my road bike out just for half an hour to stretch my legs and get rid of the stiffness, The rest of the week has been short morning and evening sessions, mainly on the road with run over Winter Hill to add a bit of (more) serious climbing. My legs feel as though they are almost completely recovered and next week I should do the 'magic 10,000 feet' and then start tapering for the 12th. Coope's Dozen on Saturday - 18 mile club jaunt over Winter Hill with 'no racing' until the 12th summit. Last year I remember hanging on to the group by my finger nails until Healey Nab when, within seconds, I found myself all on my own trying to work out how to get back to Rivington. This year may well be the same - it just depends who turns up. The rest of the week I'll be less concerned with mileage and more focused on gettiing the climbing done before winding down. Try to finalise details next week although holidays and other commitments mean that I could still be waiting on some confirmations at the end of next week but things will come together before the day. This week, for the first time, I feel the strength returning to my legs and begin to believe another attempt in August is a serious possibilty which is just as well since, with help from Colin Jones, I have my 5 navigators and some support runners identified. Until now recovery had been a matter of faith rather than a process supported by any evidence but last weekend's outings on Winter Hill went well. 16 miles and 3000 feet on Saturday followed by 21 miles and 3750 feet on Sunday and on Monday my legs were in better nick than they had been the previous week on half that distance and climbing. Three road sessions, including two on Tuesday, and another run over Winter Hill on Wednesday when I met 'Hopey' with a group of runners from Lostock at the Two Lads - good to meet you and thanks for the encouragement. I am pleased with this week's progress and am taking two rest days to ensure it continues. On Saturday Pauline and I are going over to the Dales to do a 50 mile LDWA event with about 6000 feet of climbing. Sunday will probably just be a short recovery run and if all is well I shouldn't have too much trouble getting to 70 miles before next weekend. The great temptation, that must be resisted, is to keep pushing hard to find out how completely my legs have recovered but with last week's progress I can relax about my rate of recovery and this week should just confirm everything is going well without the need to overdo things. Recovery is more prolonged than I imagined it would be so no more track or 'hills' sessions until my legs are recovered. Last Saturday I went to support another BGR attempt, to run Leg 4 on an A/C attempt but the aspirant was so late at Dunmail that it was abandoned. We ran back into Leg 3 to find them, up Steel Fell to Calf Crag and the climb really hurt. On Sunday Pauline and I did a steady 12 miles over Winter Hill and my legs were pretty weary afterwards. Monday and Wednesday I did a couple of steady road sessions with a run over the Pike and Winter Hill on Tuesday and by Thursday my legs were hinting that they might be recovering. Not wanting to spoil things I dug out my mountain bike and had a ride up to the Pike last night. After months of only running it was really enjoyable to get a bike out. Rest day today and my legs feel better than yesterday. Couple of outings over Winter Hill at the weekend and try to get the mileage to around 70 but everything is going to depend on how I feel on Monday morning. August 12th with a 22 hour schedule, as before, but with a revised start time of midnight Friday night. The additional darkness of mid-August means a 08:00 start is less practical and a lot of conventional wisdom says it is better to get the darkness done early so midnight it is. Support teams are begining to take shape and I'm looking forward to it. In Ireland, ejoying more rain, for the early part of the week and so I managed a gentle 4 miles on Wednesday night and a hill session on Thursday night. The hill session was probably a bit intense but I needed to find out what my legs are like. My split from the bottom of Foxeholes to the Mast was about 20 seconds slower (in 23 minutes) than the last time, in Feb 2006, which is encouraging although my legs are pretty tired this morning. Support another BGR attempt from Dunmail to Threlkeld with Colin Jones on Saturday and tour Winter Hill on Sunday with Pauline. The rest of the week will be determined by how I feel after the weekend. A very short stop, foot massage, fresh shoes & socks, more rice pudding (I think) and we are off with 4 and a quarter hours left. Lots of reassurance that it is still do-able as we start to climb Halls Fell and despite tired legs and wet rock we make reasonable time, 2 minutes over schedule but back into the clag that is not going to help route finding. Unable to find the top of Mungrisedale Common we are making slow progress around the end of it below the cloud base but Great Calva remains hidden even when the stream junction comes into site. Briefly the clouds blow away, Great Calva appears confirming our location as we head directly to the stream junction. Still climbing fairly well we reach Great Calva with not much time to spare, 2:06 behind schedule needing to make up, at least, 6 minutes over Skiddaw. Reach Skiddaw summit about 1.5 minutes faster than the schedule and now nothing else matters, not even the time although I know I probably can't get to the Moot Hall before 08:00 it just has to be worth the effort. 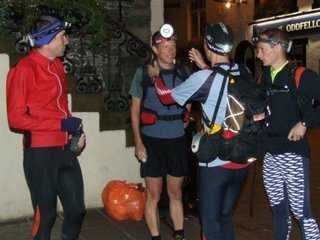 Keith, who had bivvied at Stocks Pass to provide a light to aim for, has walked up from Keswick to wait on Skiddaw summit (in really foul weather) to provide some fresh enthusiasm joins in the 'mad dash' for Keswick. Time slips away a little faster than the distance and the 24 hours is reached just at the edge of Keswick. I walk a bit in the park before resuming a trot to the Moot Hall to finish in 24:10 and it is time to start thinking about another attempt. About 15 minutes or so down leaving Dunmail for Seat Sandal eating a slab of Chris Heys' famous chocolate covered flapjack (thanks, Chris). Seat Sandal is slower than I would have liked, slower than my recces and slower than the schedule then the descent is tricky on steep wet grass and rocks, more than one slip occurs as we make for Fairfield. Cloudbase is well below the tarn and route choices are restricted to easiest to follow (or find in some instances) but the weather appears to relent a little as come off Fairfield in drifting, broken clag but no rain. Dollywagon is reached but almost 20 minutes slower than the schedule. The weather is deteriorating and our head torches start to create a virtual white-out in the rain as the light just reflects straight back off the rain drops. Nethermost, Helvellyn, Lower Man, Whiteside and Raise are all 'ticked off' but the pace is deteriorating almost as fast as the weather. The Dodds pass in a blur until the drop off from Great Dodd allows what seems like a reasonable trot towards Clough Head and the descent out of the worst of the weather. Now I realise just how slow this leg has been and that if the conditions are as bad on the final leg I am unlikely to be anywhere near the Moot Hall at 08:00. Reaching in the cars at 03:37 I am 99 minutes down having lost 85 minutes on this leg. Now I know, now I really understand just what the weather can do. The consolation, if there is any to be had, is that the Clayton team took around the same time to reach Sticks Pass and probably did this leg only about 15, maybe 20, minutes faster which must have been a good way behind their schedule too. Change of clothing, a bit of food, attention to my ankle, foot massage, fresh shoes and socks and we are off on the longest leg with the biggest climb. The Clayton team having passed us on the Yewbarrow descent leave just ahead of us but take a longer route to Scafell. Wasdale is dry and almost warm but before long the damp wind is chilling and waterproof jacket is back on. Part way up a descending walker pauses and calls out as we climb past "I did mine about 15 years ago. Well done, just keep going". A brief acknowledgment that does little to show how much I appreciate his encouragement is all I can manage. There is no "easy way" to do this climb and for once the clag helps by concealing how much is left to do. A gel halfway up helps and before long the gradient begins ease, providing the first indication that there might be an end to the torture. Having previously discounted Broad Stand as an option and, in these conditions, discounting the "climbers' traverse" we go all the way down Foxes Tarn Gully that is pouring with water, washed with rain but sheltered from the wind. Passing a group of resting walkers we cause some amusement trying to run out of the bottom of the gully and up the climb to Mickledore. The 'run' up the climb doesn't last any length of time but perhaps the clag will have concealed how quickly we were reduced to walking. Scafell Pike requires care to ensure we are not lured down the wrong descent and Broad Crag is passed just ahead of schedule while Ill Crag hides in the clag and we back track, a little, to its summit. Great End marks the end of the ridge and the end of the wet boulders that make progress so difficult. Esk Pike is soon crossed and Bow Fell reached. Retracing steps to the descent literally marks a 'turning point' on the leg because for the first time it seems instead of traveling away from Wasdale we begin to travel towards Dunmail. Descending Bow Fell is slow and conditions underfoot are treacherous but Rossett Pike is reached about 5 minutes ahead and now the wet boulders are left behind. Pike O'Stickle seems a long way away and more than a 1000 feet above us and I think this was the part of the leg I was dreading. Having recced it early in the year the climb into the Langdale Pikes seemed hard with relatively 'fresh legs' and I wasn't looking forward to it with legs that had already done over 14,000 feet of climbing. Improved fitness, the occassion and strong support team all helped to make it far less difficult than I feared. Even Harrison Stickle's 300 feet weren't too bad and are off looking for Thunacar Knott and it looms out of the mist, right on schedule. Sergeant Man then High Raise along with careful route finding ensures we lose no significant time but we are about 7 minutes down by Calf Crag and the same at Steel Fell. A slow, careful descent to Dunmail costs a few more minutes but arriving 15 minutes down doesn't seem too bad and I felt as though I had got through the longest leg, almost on time and in reasonable condition. Again it is better to be running and fresh shoes & socks and the massage help enormously. Grey Knotts seems a stiffish climb but is achieved ahead of schedule but not by one of my support runners who is left behind in the clag. The significance isn't immediately apparent but he is carrying half my carb drinks and all my food for this leg (lesson to be learned here). Brandereth, Green Gable and Great Gable all pass in the clag and I am beginning to relax for the first time as we leave Great Gable summit. The most direct route is no worse than the slightly longer route (nearer Ennerdale) but the wet slippery rocks make it unpleasant and seemingly slow. Kirk Fell is left behind and now I find out about the food & carb drinks 'left behind'. Other food is produced and eaten but I am probably still going to be short of carbs on this leg. Pillar is a long drag but we are almost 25 minutes up on the schedule and the steep rocky descent passes without incident or cramp. Thoughts of early retirement are banished and although the weather makes 'enjoyment' seem like stretching a point but everything is beginning to feel much better. The clag conceals the wall over Scoat Fell and we miss the turning for Steeple. We probably don't miss by much, just enough to need most of the time in hand to find it. Leaving Steeple a couple of minutes ahead it isn't possible not to compare Steeple on the last recce where we sat in the warm sunshine having a bite and enjoying the slightly hazy views down Ennerdale. a constant companion for the rest of the attempt. Leaving Steeple we see a team for Clayton who left Keswick an hour behind us. Red Pike is crossed quickly, Dore Head passed without pause and Yewbarrow climbed faster than schedule. Descending to Wasdale was also faster than schedule and I should have gone done the scree (as we did on the recce) especially because my trail shoes weren't capable of providing the grip needed on the steep, wet, grassy slopes. A number of slips, stumbles and falls are the consequence as well as rolling (painfully) a couple of rocks on to my right ankle. Despite the clag and everything else we are at Wasdale about 5 minutes ahead and I feel much, much better than I did at Honister. With only around 7 hours done there is a long way to go but at Dale Head I was doubting if I could get this far. Away on time at 08:00 and seemingly OK having drunk my first bottle of carbs while waiting at the Moot Hall. So far things have gone to plan, having had a good nights' sleep followed by usual breakfast of porridge with dried fruit and despite appearances a weather forecast that seems reasonable - isolated showers in a generally overcast day. The road pace might be a little quick but it is good to be running and we are soon passing Newlands Church and heading up the valley. Despite having eaten more than two hours earlier I still feel bloated and can't eat a carb bar on the way up Robinson, as planned. Gaining the ridge takes us into clouds and the first of the 'isolated showers'. Waterproof jacket is donned here and will be worn for the rest of the attempt. Descending from Robinson brings on a bout of retching and vomiting that help my digestive system a little but by now I feel so bad that I almost can't imagine continuing. Hindscarth passes in a blur and the climb up Dale Head brings a blast of diarrhea. I feel pretty dreadful now and reel with the prospect of all the training being wasted with a retirement at Honister. A poor line off Dale Head means a slow descent that costs a few minutes but we arrive at Honister just ahead of schedule. Overwhelmed by the weather through the night after a hard day in poor conditions to finish in 24:10. Despite the obvious disappointment I am pleased to have been able to get round - I know I am fit enough and that with reasonable weather I can get under 24 hours. Running and Roadside Support teams were just fantastic and I can't thank them enough. Will I try it again? I have been speaking to one or two who helped out and, perhaps, Albert Sunter's reaction typifies their commitement and ethusiasm. "I've just heard. You are going to do it again?" - "yes"
"This year" - "Probably, yes"
More details of this weekend's adventure will follow, although probably not until we get back from a week's peak-bagging in Eire. Thanks everyone for your help, support and enthusiasm. Just over 24 hours to go and with only 8 miles run this week I am as fully rested as I am likely to be. Am feeling fairly calm, at this stage, and pleased the weather forecasts seem to be improving for Saturday. There is almost nothing left to say. Logistics are handled, Support Teams are in place - full of enthusiasm and confidence. Weather forecasts seem to be improving and I am looking forward to it. There is a Clayton anti-clockwise attempt leaving the Moot Hall at 09:00 on Saturday so 'good luck' to them. 22:00 and we are off from the Moot Hall through the ginnel and out to Fitz Park. Nerves begin to relax for the first time for a week for Mark Davies as we set off with Steve Jackson for Skiddaw. I am not going to steal Mark's thunder by publishing an account of his first leg. Suffice it to say that we were a little down on schedule arriving at Threlkeld but without major incident and Mark was going well when we last saw him heading off into the darkness towards Clough Head. Mark finished in 22:36 having made up time on every subsequent leg. A couple of short, slow runs just to get last night run out of my legs and then - nothing more until Saturday morning. 53 today and by recent tradition my birthday should be 'celebrated' with something slightly out of the ordinary (last year it was my first LAMM, my first mountain marathon) and a few years before that Pauline & I did our first LDWA walk, our first night walk, over Skiddaw & Blencathra. Today, well tonight, I am going back to Skiddaw & Blencathra on a slightly different route and, hopefully, at a faster pace as a support runner for Mark Davies on his clockwise BGR. Ennerdale was hot and apart from a struggle between just before and after Iron Crag I am pleased with my run, 38 minutes faster than last year, third counting runner for V50 team that enables us to retain first place in the Championship and my first points in the club fell championship. 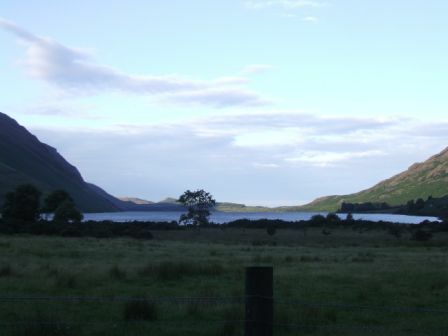 No matter how hard it is Ennerdale really is worth the effort - a classic long fell race in wonderful, beautiful countryside and I am really looking forward to my Leg 2 when some of will be revisited. On Sunday Pauline and I went to the Ulpha Fells for a fairly gentle 16 miles and 4000 feet to visit 14 Wainwright Outlyers - I know this is the start of my taper but the weather was too good not use. The rest of the week was pretty quiet - 12 miles and not enough feet to mention. Injuries continue to force changes. Paul Murray pulled a calf muscle trying to recover from a previous pull and is now pessimistic about his chances. Brendan has stepped in to navigate Leg 4 and Suzanne is hopeful (and probably hopelessly optimistic) about her ankle recovering sufficiently. It would be great shame if she is unable to make it because from the very beginning she has been very supportive and hugely enthusiastic about the whole thing. Chris Heys is making a 'Rooney like' recovery and running well in the Horwich Tour so he looks good for Leg 5. Leg 2 Recce went well, almost perfectly, on a hot sunny afternoon. We were in Wasdale about 45 minutes ahead of schedule and although the pace wasn't distressing (for one leg on the day after a rest day) I don't think it would be sustainable for the whole route. Still have trouble eating and drinking enough although it is getting easier, now that the drinks are not so cold. The only problem last Saturday was during the descent from Yewbarrow when Suzanne went over on an ankle, same one as in February coming off Great Calva, but much worse this time. With over two hours running and climbing over Beck Head left to do to get back to Honister it was a pretty painful end to the day, for Suzanne. Pauline & I managed a fairly gentle 10 miles or so over Winter Hill on Sunday but my legs were still tired. Planning for two days rest before Ennerdale and the start of a 'slow taper' thereafter means all my hard training is now at an end and it feels pretty strange. Ennerdale on Saturday and on Sunday Pauline & I plan to do a 14 mile route over 14 of Wainwright's Outlyers between Eskdale & Dunnerdale - a quiet area we haven't visited before. The rest of the week will involve helping at a couple of races in the Horwich & Rivington Tour and perhaps another 30 miles without any significant climbing. Apart from a few niggles, most of which have gone, my training has gone better than I could have hoped. I think I am fit enough, my support teams are strong and experienced enough, a few details about road crossings are still to be finalised but things seem to be coming together and I am looking forward to it. 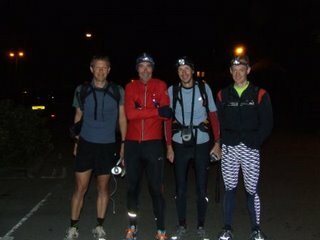 A weekend in Northumberland, marshalling on the LDWA 100, brought back some painfull memories as our checkpoint was the following my own nadir - it did allow us to see Ian Hill (first finished in 22 hours 20 minutes) looking pretty good as be set out to tackle the final 17 miles - what a performance! My new Mudclaws performed admirably last weekend and while 'short distance thoroughbreds' might find them a little 'clumpy' they seem to offer more protection to toes and feet than the lighter, original version. A reasonable mileage over the weekend plus pre-porridge runs brought 100 miles within reach by Thursday and so I missed the hill session (Up and around the Two Lads, perhaps - I think I recognised some familiar faces as I slogged up to the Trig Point) to get some extra miles to reach 102 for the week. A run round Leg 2, Honister to Wasdale, on Saturday with most the Leg 2 Team and something more local on Sunday with Pauline who, after her Manchester 10K success is looking for something more substantial and, at this stage, the Great Langdale Marathon is emerging as favourite. Next week will be easier than this not least because of Ennerdale at the end of it. Big teams, I know, but last minute problems can and do occur and, for everyone else at least, it is a very enjoyable day on the fells and I am glad to be able to provide an excuse for that. Roadside support is almost finalised and I should be able to complete the details next week. Thanks to you all for your support and eccouragement and for your kind words about this blog - I don't think I ever expected anyone to read it but the comments confirm a far flung readership, including Brendan in Melbourne. Good on ya' mate. Proved more of a trial than we would have liked. Initial doubts about Kev's fitness we overwhelmed by the after-effects of a serious leg infection and the subsequent antibiotics used to treat it. By Helvellyn we were 15 minutes down on last year's time and at Angle Tarn 31 minutes down. I then made a spectacular route finding error involving Esk Pike rather than Esk Hause (is there a pattern here, I have to ask myself?) and although the error was recoverable we made the decision we should have made at Angle Tarn and retired. As a training run, despite the poor conditions that forced another 11 teams to retire, it was a worthwhile outing with almost 24 miles and 7500 feet of climbing. Our pace was slow and on Sunday I ran a PB on an 8 mile training route and so while I am disappointed about the OCT I am happy with my fitness despite, on Saturday, breaking a toe nail (still attached and taped in place); injuring a joint in my left foot with my ankle strap (almost recovered) and getting water into my Polar 625X watch. It has been a disappointing bit of kit - watch has been returned to Polar once, the transmitter belt twice and I still usually get straight lines on the trace, the altimeter doesn't record properly, it is no longer waterproof and struggles to download to the PC. One to watch for me as Pauline was runnning. Hoping for a sub 60 minute time she finished in under 52 minutes with a 51:45 time. At least one of the family finished a race with a good time. After the weekend I added 4 morning pre-porridge runs to the regular evening runs to push my mileage a bit and what a week - 7 consecutive sessions in the rain! We are marshalling on the LDWA 100 in Northumberland but we will manage to get some miles in from our checkpoint. I have new pair of Mudclaws to break in as my original pair are pretty nearly finished and so Saturday morning's run over Winter Hill should do that and if I continue the pre-porridge outings I should again hit high 80s next week. It has been drawn to my attention that the entry describing our adventure on Leg 5 could be construed to imply that I absolve myself of any blame for the route finding errors. That wasn't entirely my intention and I would be prepared to conceed that this may not be entirely apparent from a first reading of the text. It may be that it is not entirely apparent from subsequent readings either and so, to set the record straight I would admit (under some duress - like the need for a navigator on Leg 5) that John offered the correct bearing from a spot that we both agreed was correct. The fact that neither of us had a clue where we were, apart from in very general terms, is probably of some relevance here but John was confident and I don't believe you can ask more from a navigator than confidence, because if you are confident you can get lost really quickly rather spending hours over it. Two days on the route last weekend. Leg 5 on Saturday with John Swift on a 22 hour schedule apart from the section to Great Calva where John felt the conventional 'direct' route was too short for a Saturday morning run and so, in the clag and on the correct bearing (from the wrong place), added a big long left arc round Mungrisdale Common down a valley neither of us had ever been in. Very pleasant and I'm glad he he has got that option out of his system because in many ways the 'direct' route is peferable. On Sunday I had another go, on my own, at Leg 4. Again, in the clag, but without any major route finding errors apart from the Clough Head descent and again, despite carrying 2.5 kilos of food and water, on a 22 hour schedule. Monday night's run was wrecked by a failed computer, trivial I know, but it was the machine I keep all my training records, routes, BGR support details, etc, etc on and I had to reconfigure another PC to be able to use backup data (nothing lost). Three mornings were enough to make up the mileage although they meant Wednesday and, particularly, Thursday evening sessions were hard. Old County Tops with Kev Latham who has been working in Iceland all winter and claims not to have been able to get in sufficient mileage but we will see tomorrow. In any event, I want this to be a long, injury-free, training session. Sunday sees Pauline tackle the Manchester 10K and I am hoping to be able to manage a recovery run before dark - which would be a considerable improvement on last year. A few mornings next week to try to get over 80 miles but much will depend on tomorrow and Sunday. Final details being added now and I hope they will all be finalised by this time next week when I'll publish them and start getting the details for road crossings finalised. After last week's rest, this week has back to something like normal. 24 miles over and around Winter Hill on Saturday morning before going over to Belmont to watch the Belmont Winter Hill race and about 17 miles on Sunday over Helvellyn with about 11,000 feet of climbing between them. I hadn't quite recovered from last week because my legs were very tired at the end of Saturday and heavy on Sunday. Monday was just an easy leg stretching 4 miles and the M60 prevented me getting to the track session. A fairly good hill session last night suggests recovery is complete, ready for next week. I ddin't manage any pre-porridge runs - I just wasn't up tp it, perhaps next week. Leg 5 on Saturday with John Swift so that he can check his compass bearings and I can have another look at the last 3 climbs. Leg 4 on Sunday so that I can have another look at the climbs and the direct descent from Fairfield that I couldn't find (didn't even look for) in the clag. Rest of the week as normal with a couple of morning runs to keep the miles up. Until a week or so ago I was perfectly happy with my published 23 hour schedule but since then I have been encouraged to consider something more challanging. Determining what is a realistic schedule (in good conditions) is difficult so I sought the advice of Paul Murray, a vastly experienced ultra distance fell runner. The main points of his advice are to remember the key objective is to finish in under 24 hours and you need to make the schedule your 'friend' because otherwise it becomes your 'enemy'. In other words, it is easier to run 21 hours off a 22 hour schedule than it is off 20 hour schedule because you will be ahead of the 22 hour schedule (and relaxed about it) whereas you would be chasing the 20 hour schedule all the way, and not catching it. On that basis, I am going with a (revised) schedule of 22 hours and aiming to get close to 21 hours. The potential flaw with this approach is the danger of arriving at road crossings so far ahead of the schedule that the support team is not ready. Only the last and second last crossings really present a problem, in this respect, and so we will have to ensure support runners are advised durign the day of actual progress. I'll publish a revised schedule over the weeked - watch this space. Last week was really only the '100' and recovery from it. Monday was spent comatose from lack of sleep. My feet were still painful on Tuesday & Wedensday but by last night, once I got the tape off and punctured the large blisters on my heels things were much better. We got a number of things right on the '100', especially on the first day - eating and drinking regularly. Shoe choice was proabably impossible - road shoes were needed for the cushioning but wouldn't have been to good on the roughest ground (no-one else selected road shoes either). Not eating frequently enough was nearly our undoing on the second day but eating and drinking enough at the 85 mile CP provided a complete recovery and that shouldn't be forgotten. Long run over Winter Hill on Saturday before Belmont Winter Hill race which I shall enjoy as a spectator. BGR Leg 3 on Sunday. This marks a change in planning as it is an attempt to see if a schedule faster than 23 hours might be achievable. Until now I have always run legs with other people, primarily to learn the route and to improve my fitness, now I will start to pay much more attention to the schedule. I will also try a couple of morning runs to keep the mileage up. 101 miles, 13500 feet in 33:21:34, Pauline was second overall and 1st lady with Keith & I just behind. We are all pleased with the time, especially Pauline & I, our first '100' with only one person faster. The Marshals' event attracts a smaller field and most people consider it to be more difficult because almost all the time you are on your own, out of sight of everyone else and so it proved. Saturday was warm and sunny, the ground dry and very hard - much like the tarmac the route reverted to all too often. Like most other people we travelled fast throughout Saturday but by the evening the heat and hard ground was beginning to take its toll. Medical tape contains the worst of the damage to our feet but doesn't help Keith's groin strain very much. With sub-zero temperatures forecast for the night we were glad to be descending from Windy Gyle's 2000 foot ridge as darkness (and the temperature) fell. A brilliantly clear night, far from any city's poluting street lights provided the brighest stars we have for a very long time. Breakfast stop is reached at 04:30 after 62 miles. Just half an hour here and off into the second day. A little light rain greets us with the daylight and we are beginning to consider that our feet are not any worse than they were twenty miles ago, which is pretty encouraging. Other things, however, begin to slip a little. Throughout Saturday we had handed round food every half hour or so to ensure we all kept eating but this was overlooked first thing Sunday - probably because we were tired nad because the first hour or so after breakfast can be very slow (after the first long stop) - and somehow we never really got back into the habit. Times through the chekpoints confirmed we were losing a little on the two in front and gaining on the people behind. After around 80 miles we were all really struggling and by the checkpoint at 85 miles I was reduced to little more than a plod. We couldn't afford to go any slower so made an effort to eat more than any of us wanted and then agreed to make a big effort to the next CP, a further 3.7 miles with a 330 feet climb. 65 minutes got us to the CP and we carried on straight through to the next where a 5 minute break was enough to see us through the last CP to the end in Wooler. the last thing I must mention is that having strapped my left ankle I didn't get so much as a twinge from it for the first time in over a year. By Thursday night I had removed all the tape from my feet to find two very large blisters on my heels. After lancing them I managed a comfortable 4 miles on the road and although my right heel is still tender it will, I am sure, be fine for the weekend. Saturday with Colin Jones & Steve Barlow over High Street was hard - hard in that the pace was faster than I can comfortably run along with several thousand feet of climbing thrown in as well. I added to the discomfort by going over on my left ankle a couple of times. This is becoming an all too frequent occurance, usually when it has just about healed from the last time I do it again. It is never bad enough to stop me running but it does make me leary when descending. My foot placement is probably not great - I tend to run slightly hen-footed and don't try to counter the resulting tendancy of my foot to roll by placing my big toe firmly on the ground while keeping my left foot turned out.. That is all I have to remember when descending rough ground (thanks Norman). I am also going to try strapping the ankle because I really don't want it to get any worse. Sunday's long run with Pauline was a struggle for us both and it must have been due to the last lingering effects of travelling back from New York. The rest of the week went well and Wednesday morning I managed 4 miles before porridge as well as 13.5 miles in the evening for my first twice in a day session. I thought about going out again on Friday morning but decided to save whatever is left in my legs (not much) for the weekend. This is the first of a number of 'big weekends' over the next few weeks. We are off to Northumberland for the LDWA (Marshals') 100. When we first heard of it we thought it was just a name and didn't realise it had anything at all to do with the distance! This year it is just under 102 miles of continuous running/walking with about 14,500 feet of climbing. The plan is to do the first day at a little under a BGR pace, walk through the night and then see what the morning brings. The plan is to finish in under 36 hours, aiming for something close to 33 hours but we shall have to see. The rest of the week is going to be about finding out quickly I can recover. We took our running kit to New York but, honestly, the prospect of running 12 blocks or so to get to Central Park at the end of a day's sightseeing that usually involved 6-7 walking was just so awful we decided not to bother. A week's rest with about 6 hours walking (and queuing - Statue of Libery takes a whole day. You have to queue to join the queue for the ferry and don't ask how long the ferry queue was) but what a place. Somewhere in the Lakes on Saturday and something long locally on Sunday and a couple of mornings during the week to start to increase the miles. No alcohol from now on - does abstinence matter? Apart from dehydration that can be fairly easily overcome it inhibits glycogen production which impacts badly on recovery. Do you have to stop drinking to complete a BGR? Almost certainly not but (if you are a mere mortal) you have to do everything you can to increase your chances of getting round. You can only wish for good weather but for everything else there are choices and opportunities to make things just a little bit easier. Enough philospophy - need to sort some kit for this morning's run in the Lakes. Being a bit short, there is a tradition amongst a (very) small group of Horwich runners to have a run up Scafell Pike in the morning before dashing back to The Crown for The Pike race. Madness, I know, but given reasonable weather it becomes a good day out. With Mark Davies, John & Ed Swift from the Old Dungeon Ghyll. Mark & I included Esk Pike on the way up and Rossett Pike on the way back. Deep snow patches and fair bit of icy snow at the top of Little Narrow Cove made the final ascent a bit more entertaining than we (or at least, I) would really have liked. With John and Ed a year ago we reached the summit (without Esk Pike) in 1:56:50 and this year in 1:54:12. Last year we were back at ODG in 3:39:12 while this year Mark & I gat back in 3:27:05 having gone over Rossett Pike on the way back. Last year, after Scafell Pike but without a 10 mile road race the previous day, I managed a PB of 26:05 placing 17 of 33 V50. This year - another PB of 24:21 placing 5 of 25 V50. It may get quicker, slightly, but it doesn't seem to get any easier. Great day - thanks to everyone who helps make The Pike race happen. Thanks John, Mark and Ed for the other Pikes. Off to pack some running kit for Central Park. An easy week, at least in terms of miles, but with plenty of climbing particularly during last weekend in Galloway. Weather turned out much better than we could have hoped - well, perhaps, apart from the strong wind whipping up the snow and ice as we walked down the Rhins of Kells. Having been battered off the ridge last year this was a huge improvement. Sunday was just as good although, perhaps, the wind dropped a little. On both days the Southern Highlands and Arran were clearly visible - both with heavy coverings of snow. Monday I should have started to make up the miles but my first Swoops came back from Lancashire Sports Repairs, newly fitted with their studs so I had to try them and they are much better than the original sole. Swoops are, probably, a little heavy and not quite as stable as Walshes and with their original sole don't grip as well but they do offer a degree of cushioning which matters, to me, on long outings. The rest of the week was pretty standard until today when Pauline and I went to Caldervale for the 10 mile road race. Pauline finished just inside her target of 90 minutes and is very pleased with her first ever race and I finished in 70:25 with which I am pleased. Ready now for Scafell Pike tomorrow morning and Rivington Pike in the afternoon. After "The Pikes" tomorrow we are off to New York for a few days and so although I anticipate a few miles through Central Park it will really be a rest and I'll be really looking forward to running in the Lakes when we get back. This week started with a short but hard outing to Coniston with Suzanne Budget & Colin Jones. Round the fell race round in a howling gale. Part way round I mentioned to Colin that I had wondered about cancelling the trip in the light of the weather forecast "you could get winds like these on your Bob Graham", he replied. Wrong place for sympathy, obviously. By course record standards it wasn't a fast round but by my own, more modest, standards it was uncomfortably fast - and just what I needed. On Sunday Pauline and I went over to Yorkshire to do the LDWA Blubberhouse Moor 25 and got round in 05:08 with which we were quite please especially given that most of the second half was done in pouring rain. Great route, good event but take your own food (unless you really, really like jam butties). Slow traffic and faulty central heating controller meant missing Thursday's hill session but I went on my own and did the 8 miles I needed for this week's 71. Finally, my weekly average weight is below my target of 154 lbs so I all have to do now is keep it there and so this will be the last appearance of weight and weight loss on the weekly updates. Unusual week because we are off to Galloway for the weekend to have another go at completing the Rhins of Kells, a 20 odd mile long ridge that we were blown and battered off a year ago. Unfortunately the weather forecast is even worse than it was then. We will walk again on Sunday so for the first time for awhile I'll have two consecutive rest days. The start of the week should be as usual but with the Caldervale 10 road race on Friday, Scalfell Pike on Saturday morning and Rivington Pike fell race in the afternoon my next rest day will be a week on Sunday.